One thing is certain; Parliament has already voted in support of the Brexit, which determines UK’s departure from the European Union on March 29, 2019. Now the ultimate question; will the UK leave the EU with no deal? Reagrdless, Brexit will continue to dominate UK politics this week as the parliamentary debate over Prime Minister Theresa May’s plan to leave the European Union looms, which could determine both, the future of Brexit and the fate of her government. The five days of debate in parliament precedes the crucial vote on December 11th, when Members of Parliament will be asked to approve the deal. Meanwhile, Mark Carney, the Bank of England (BoE) governor, spoke on Tuesday at the Treasury committee over Brexit’s impact on the economy. He was under pressure to clarify his projections, including a likely 8% contraction in the worst-case scenario. The United Kingdom (UK) Markit Services PMI fell to 50.4 in November, compared to the 52.2 registered in October and failing analyst expectations of 52.5 rise. This economic indicator captures an overview of the condition of sales and employment. Any reading above 50 signals expansion, which is seen as positive for the GBP, while a reading under 50 shows a contraction and consequently negative for the GBP. On the other side of the Atlantic, the US Markit Manufacturing PMI also fell to 55.3 in November, compared to the 55.7 registered in October and missing analyst estimates of 55.4. However, the reading indicated a solid improvement in the health of the sector that was above the series trend as new orders rose the most since May and job creation was also stronger. On the other hand, business confidence was the lowest since September of 2017 amid concerns over the sustainability of the current sequence of new order growth. A reading above 50 indicates expansion in the sector; below 50 indicates contraction. A higher than expected reading should be taken as positive for the USD while a lower than expected reading should be taken as negative for the USD. Since the beginning of 2018 until last Wednesday close, the GBPUSD remains negative with a loss of over 5.5% but since the start of December continues below water with a 0.24% loss. Nonetheless, since the beginning of the week the currency pair is running flat with a minor loss of 0.03% and on the daily time-frame closed slightly in the green with a gain of 0.17%. Furthermore, the GBPUSD is in a bearish phase since early November. During last Friday session, the currency pair went back and forward without any clear direction, consequently closed in the middle of the daily range, in addition, managed to close within Tuesday range, which suggests being clearly neutral, neither side is showing control. The stochastic is showing a strong bullish momentum although is still below the 50 midline, although crossed above the oversold zone. The MACD histogram (OsMA) indicator is setting higher lows while the price is making lower lows, signs of a potential bullish divergence. In this case, the bullish divergence suggests a possible trend reversal to the upside. In early December, the GBPUSD managed to make a new year-to-date low at 1.2657 and the constant failure to breakout significantly in either direction, higher or lower indicates that investors are still in the dark on how the Brexit will develop, with all options still open. 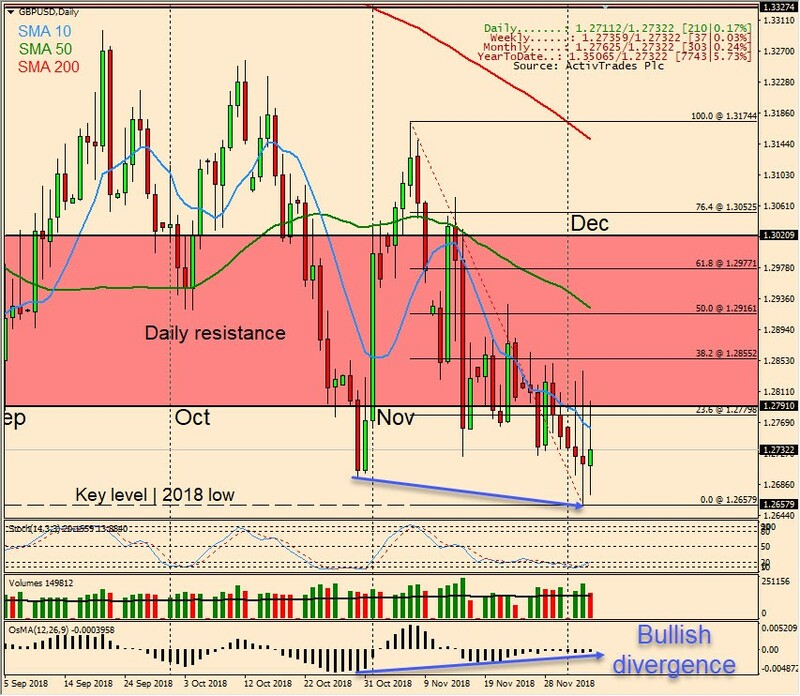 The currency pair seems to find significant resistance near the 50 Fibonacci retracement at 1.2916, which is in the confluence of the 50-day moving average that should act as a dynamic resistance. On Wednesday, November 07 at 15:15 GMT (10:15 ET) the Federal Reserve (Fed) Governor Jerome H. Powell is scheduled to testify on the economic outlook and recent monetary policy actions before the Joint Economic Committee, in Washington DC. The testimony is in two parts; the first is a prepared statement, then the committee conducts a question and answers session. The Q&A portion of the testimony can see heavy market volatility for the duration. On Friday, December 07 at 13:30 GMT (08:30 ET) the US Department of Labour is scheduled to release the nonfarm payrolls for November, which are estimated by marker analysts to decrease to 205K from 250K registered in the previous month. Generally, a high reading is seen as positive for the USD, while a low reading is seen as negative, although previous months reviews and the unemployment rate are as relevant as the headline figure, and therefore market’s reaction depends on how the market assets them all. At the same time on Friday, the US Department of Labour is scheduled to release the unemployment rate for November, which is forecast by marker analysts to come in at 3.7% unchanged compared to the previous month. A decrease of the figure is seen as positive for the USD, while an increase is seen as negative, although by itself, the number can’t determinate the markets move as it depends on the headline reading, the nonfarm payroll.